A five-volume work of great magnitude on the true meaning of Leadership. The fundamentals of leadership are based on the principles of the teachings of the Ageless Wisdom. 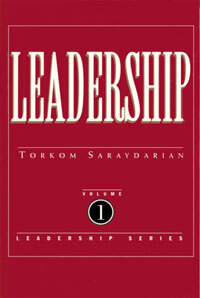 The author, Torkom Saraydarian, was one of the great spiritual leaders of the twentieth century. The five volumes are printed in chronological order of his discoveries and writings. The monumental work will pave the way for the true leadership that is needed in the twenty-first century. "Leadership is vision. Leadership paves the way for freedom. Leadership is not dictatorship. Leadership is the ability to go ahead with one's own evolution and share his achievements with others." "Leadership belongs to all human endeavors. The real leaders are those who, in their particular field, cultivate the principle of sensitivity and direction toward the Common Good and who, in cooperation with all other fields, respond to the principle of synthesis." "Whenever you encourage people toward light, love, striving, and perfection, you are a leader." Included In this volume you will find: Leadership Essentials, Leadership and Inspiration, Leadership and Religion, Leadership and Faith, and How to Be a Discriminating Leader.